Word Savvy: Strike That. Reverse It. Remember Claire? She was our nanny from the time Mac was born to the time he was three years old, and therefore obviously deserves a Nobel Prize of some sort. Now Claire is just about eight months pregnant with her first child, and I got to go to her shower yesterday. 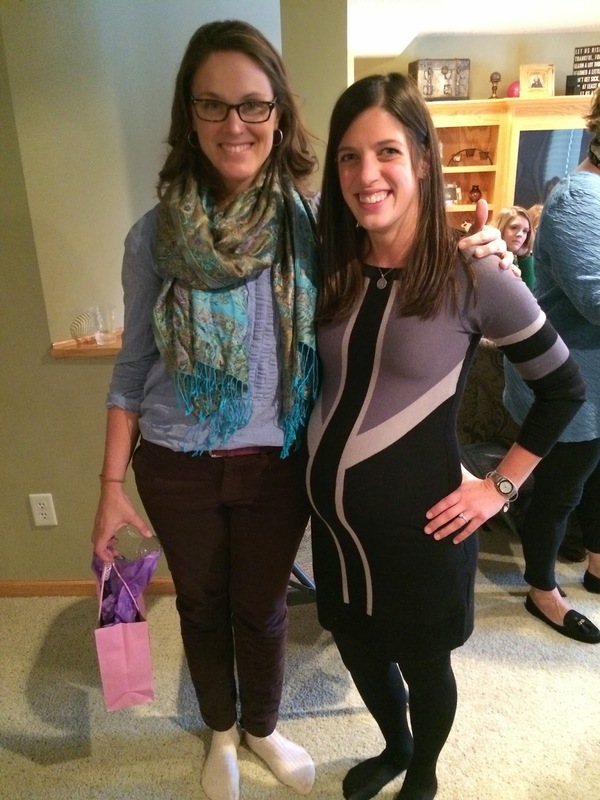 I have to say, I felt a little bit old attending a former babysitter's baby shower. But on the other hand, it felt like a baton was passing. Do you hear what I'm saying? Go, Claire, go! I know it's hard to tell, but that tiny person on the right is just about EIGHT MONTHS pregnant. One of the shower games required guests to take a piece of yarn and estimate how big around Claire's "belly" is. I simply measured my own non-pregnant waist, and that was about right. I didn't allow this game to be played at my own baby shower because we would have needed many, many skeins of yarn to accomplish it. And, I would have cried. I didn't win the belly estimating game, but I did win another one, partly because Claire's mom (Hi, Anne!) let me cheat off of her just a tiny bit. As a result, I got to munch delicious chocolate-covered cranberries on the way home. Divine. It's my cranberries! Partly procured through cheating. I got Claire's baby an adorable organic cotton outfit and matching hat. The baby will be very pleased to wear that outfit. Good job winning stuff at the shower. That's a good prize too. Well done, Shower people.